United Way of Southern Nevada’s (UWSN) Young Philanthropists Society (YPS), Silver State Schools Credit Union (SSSCU) and Andson Inc. are proud to announce that children saved a record-breaking $73,169 with more than 70 percent participation through the unique “Piggy Bank” savings program during the 2015-16 school year. The only program of its kind in Nevada, this financial program incorporates actual banks at Bracken, Long and Hollingsworth STEAM Academies. Designed to teach students financial capability through learning and doing, this fun, hands-on interactive program incorporates in-class curriculum consisting of five fundamental lessons that any individual could benefit from. Curriculum includes “needs” versus “wants,” financial concepts, money saving habits, the value of money and financial decision-making skills. Key to the ongoing success of the “Piggy Bank” are partners Silver State Schools Credit Union (SSSCU) and Andson Inc., who helped to create the program. The program operates kid-friendly banks at each participating elementary school that includes bank teller counters and wall decals with money saving tips. From its 2012 opening to date, more than $162,616 has been was saved through the YPS “Piggy Bank.” Through programs like the “Piggy Bank,” United Way of Southern Nevada works to increase the financial success of the community by building a solid foundation for families and individuals to obtain economic independence. United Way of Southern Nevada’s Young Philanthropists Society is a membership group of financial contributors who are committed to making a difference in children’s lives through volunteerism, mentorship and events by harnessing the energy, commitment and diverse skills sets of the next generation of leaders. For membership information, contact Lawrel K. Larsen, Senior Director, Major Gifts at LawrelL@uwsn.org or 702-892-2319. United Way of Southern Nevada unites our community to improve people’s lives. With the support of a committed group of strategic partners, we create bold and positive change for Southern Nevada’s most vulnerable populations through innovation, leadership and collaboration.Through our focus in Education, Health, and Income we provide the foundation for a better community for all. To learn how you can be a part of the change, please visit www.uwsn.org. Silver State Schools Credit Union (SSSCU), founded in 1951, is a state-chartered financial co-operative. 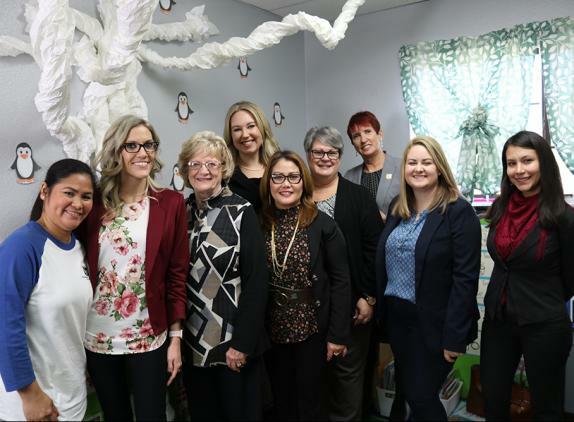 The Credit Union serves over 50,000 members of the educational community and their families in Nevada with eight branches throughout the Las Vegas Valley. SSSCU provides “Excellent Member Service and Financial Solutions – for Life!” via a wide range of banking products, discounts and resources. By members' choice, member shares and deposits are insured by American Share Insurance up to $250,000 per account. This institution is not federally insured. For more information, visit silverstatecu.com. Andson was founded in 2009 with the mission to educate, inform, and inspire youth and young adults through innovative programming in Academics and Personal Finance. During the 2015-16 school year, Andson reached 15,000 students through Andson Academics and Andson Money.